The Indy Chamber, AIA Indiana and ACEC Indiana recognized the Liberty Fund corporate headquarters project with five awards, and CE Solutions was honored to be among the firms honored, in addition to Rowland Design, R.E. Dimond and Darwin Branded Environments. It’s nice for our team to get the recognition, and it’s great to see members of our team recognized. But even more fulfilling was the opportunity to collaborate with the project team to realize the vision of this unique project. Liberty Fund was founded in 1960 by Pierre F. Goodrich, an Indianapolis lawyer and businessman. The private foundation contributes to the preservation, restoration, and development of individual liberty through investigation, research, and educational activity. The iconic design of their new 61,000-square-foot facility communicates Liberty Fund’s purpose and supports its operations. “The Liberty Fund library was designed to celebrate the books, their authors, and the inspiration they provide,” said Eric Rowland, principal, Rowland Design. The library is the focal point of Liberty Fund’s headquarters and showcases multiple custom-designed and fabricated, treelike columns made of engineered glued laminated timber. These unique features created multiple complexities for our team to solve. Seven of the largest columns, approximately 100 feet by 30 feet, support the steel framework of the library’s roof as well as the cantilevered mezzanine system overlooking the main level of the library. This allowed for a column-free clerestory extending the full height of the building and providing visibility to the book collection and structure within. The tree columns tilt inward and taper at the top, while smaller timbers branch out to support the cantilevered channels of the roof framing. Braced frames adjacent to the library resist the lateral forces. 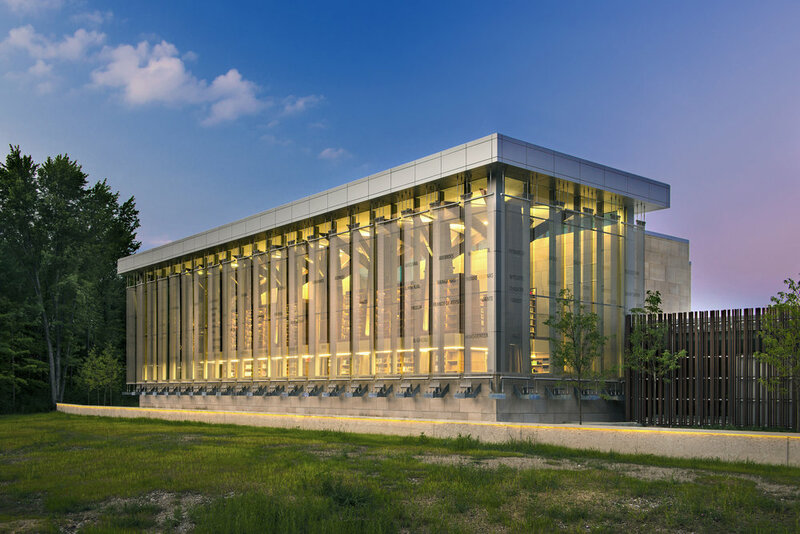 Another structural challenge included designing the structural supports for a specialty screen system featuring 30 stainless steel panels that envelop the exterior curtain wall system of the library. This system protects the book collection from the sun while outlining the timeline of liberty. The tightness of the screens had to strike a balance of limiting movement while avoiding undue stress, and the curtainwall system they surround was the first of its kind installed in Indiana. Clear communication and collaboration is a must on any project. In complex projects in particular, taking advantage of advancements in technology provides notable benefits. Given the innovative structural system and unique tree columns, REVIT building information modeling software was critical to the design process and communication with the fabricator and contractor. The detailed connections and one-of-a-kind structural solution called for close coordination and communication with team members. CE Solutions is grateful to have been part of this collaborative effort that embodies the purpose of Liberty Fund.